The Monorail Malaysia project originally started in 1997 as the Kuala Lumpur Monorail project. The Asian Economic Crisis of 1998 almost derailed the project completely. Faced with an astronomical increase in the price of the Japanese-built imported trains, the officials were forced to look at alternative solutions. In 1998, the decision was made to cancel plans to import the Japanese trains and to produce them locally instead. 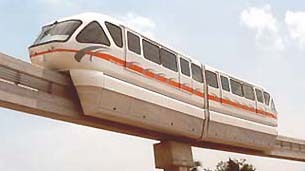 A prototype of Monorail Malaysia was completed in a 3-month period and began tests in August 1999 on a 100m test track at the Monorail Malaysia Technology (MMT) plant. 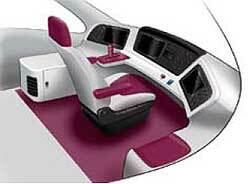 Over 2-1/2 years, improvements were made in the vehicle, and the first production vehicle was completed in April 2001. The Malaysian-made system utilizes substantial local content for its components and was able to realize a 50% cost savings over the Japanese system. MTrans opened the Kuala Lumpur Monorail in 2003. In 2007, Monorail Malaysia (also known as MTrans), was acquired by Scomi Rail. Efforts to market the Scomi Rail Monorails around the world are being pursued aggressively. 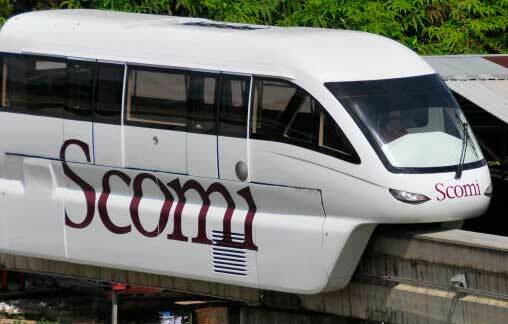 In 2008 Scomi was contracted for a 20-kilometer system for the Mumbai Monorail in India. See our Special Features page for a 13-page photo essay of the Kuala Lumpur Monorail.